Heating, Ventilating, and Air Conditioning (and Refrigeration), or HVAC/R, units are critical for maintaining an optimal climate and clean, odor-free air inside buildings of all sizes. HVAC/R systems control the temperature of the air, the humidity, and even the movement of the air to help keep the people who are inside the building comfortable. As EDC Mag — a magazine for LEED professionals — describes, the American Society of Heating, Refrigerating and Air-Conditioning Engineers to optimize the comfort for a building’s occupants set rigorous standards for indoor air. As EDC Mag describes, these various parts will all work together to carefully control the climate and produce the desired air quality. Trane.com explains that the central cooling part of the HVAC/R system will have refrigerant that passes through the cool coils. The warm air will blow over the coils, which absorb the heat. The refrigerant, which as a very low boiling point, is passed through the compressor, condenser, and expansion valve, which deposit the heat outside and cool the refrigerant once again. The cooled refrigerant moves back into the coils to begin the cycle again. The air conditioning system will also help by absorbing moisture from the air, which helps control humidity and air quality inside the building. When the air needs to be warmed, the central heating component of the system will turn on. This system is comprised of some kind of heating appliance, such as a water or steam boiler. This heat source will produce gasses that are passed through a heat exchanger. Internal air is then passed over the heat exchanger and then blown through a series of ducts throughout the building or home. EDC Mag explains that buildings are required to ascribe to the local regulations regarding ventilation codes. 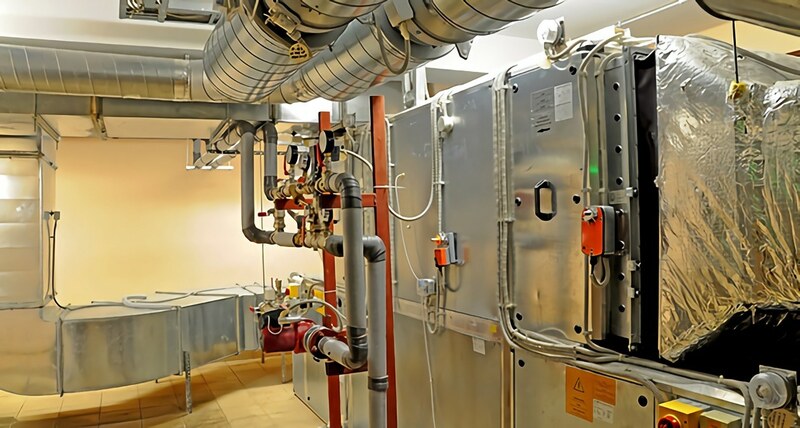 Regardless of what the specific code regulation, all ventilation systems involve bringing in outside air, filtering it to remove particles, and expelling it throughout the building. Outside air is typically brought into a mixed air chamber, where it mixes with return air that has been blown in with a return air fan. The mixed air then proceeds together through the filters and over the coils where it picks up heat or is cooled down, depending upon which system is running. Refrigeration systems operate on the same principles as air conditioning systems, as MIT author Roger Yeh describes in detail. The refrigerant starts out in the coils, where it cools the air in the unit. The warmed refrigerant moves through the compressor, condenser, and expansion valve, which deposits the heat outside the unit and cools the refrigerant to begin the cycle again. These systems tend to work with different refrigerants and have lower goal temperatures, so that they can be used to safely transport food, medicine, and whatever else needs to be refrigerated. Just about everyone in the modern world owes a considerable amount of comfort to HVAC/R systems. They keep buildings around the world cool and dry. Those who have received HVACR training understand how these systems work and help keep them running smoothly, so that people remain comfortable indoors.